Evanston, IL. The Chicago Force (5-0) turned in another dominant performance on the football field at Evanston High School with a 54-0 win over the West Michigan Mayhem (3-2) last Saturday night. Chicago scored on its first two series as Smith scored on a six-yard run and Gray caught a 30-yard pass from Grisafe. The Force jumped out to a 38-0 lead in the first half as Jeanette Gray, named offensive player of the game, caught three touchdown passes while the Mayhem was held to 41 yards. Gray had one of the best efforts of her career with five catches for 181 yards. “Last year, she was one of the leading receivers in the WFA. Jeanette is a special talent.” Gray came to the Force after playing high school and college basketball in Valparaiso. Gray has reaped the benefits of playing in Chicago’s fast break no huddle offense led by Grisafe. “You know we are going to throw the football,” Gray said after the game. “You know you are going to get a chance to make some plays. You have a good quarterback that is going to put the ball where it needs to be. It’s a fun offense.” Chicago has scored 251 points this season behind the 1-2 punch of Grisafe and Smith. Gray still believes there is room for improvement. “We still have a lot of work to do,” Gray admitted of the offense. The defense had a hand in this winning outcome. 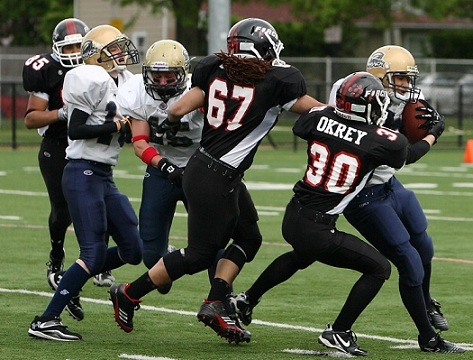 Chicago put the clamps on Mayhem running back Telly Robinson and quarterback Nicole Beier. Robinson had 34 yards rushing on 17 carries while Beier had just nine completed passes in 30 attempts. The Mayhem was averaging 32.5 ppg on offense. Smith tallied twice in the second half to put the finishing touches on the win. Chicago will face the Cleveland Fusion this Saturday night in Cleveland.